The world's largest retailer applied for six patents last year on drones that aim to prevent damage to crops, control pest attacks on farms and cross-pollinate plants, according to US Patents and Trademark Office documents made public last week and seen by Reuters. Groceries make up 56 per cent of the company's total revenue and Walmart may see drone technology as one way to get food from farms to store shelves faster and more cheaply to compete with Amazon.com Inc, following its purchase of Whole Foods Market last year and the expansion of discount chains like Aldi and Lidl. Using technology to precisely apply pesticides rather than spraying entire fields can benefit the environment and save money for farmers. As part of a sustainability push in recent years, Walmart has also worked with suppliers to reduce the amount of fertiliser used to grow crops because it can pollute the environment. In US agriculture, drones are most often used to survey farms that can span hundreds of acres. The devices fly above fields and take photos that help growers estimate the size of upcoming harvests or identify problems, such as weed infestations and nutrient deficiencies. Other industries have also turned to drones, with AT&T Inc using the devices to look at cellphone towers in Texas last year after Hurricane Harvey. Insurers such as Allstate Corp use them to assess property damage. 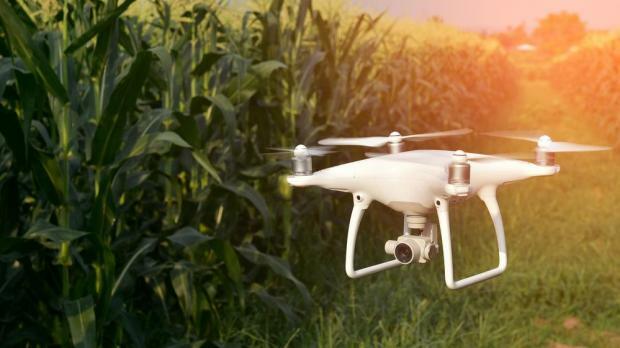 The market for agricultural drones will top $1 billion (€809 million) by 2024, up from about $338 million (€273 million) in 2016, according to research firm Global Market Insights.